The theme for this year’s sports week was World Athletics Championships. Pupils were active for 5 – 7 hours during the week which is the minimum amount we want them to strive for on a weekly basis. Luton Town Hockey Club, Bedfordshire Cricket and Chance to Shine ran sessions pupils as part of our school-club links. It was great to see how many parents came to support the children throughout the week. KS2 children had a sports writing competition during the week where year 3 & 4 winners attended the Women’s Cricket World Cup semi final and year 5 & 6 winners attended the Para World Athletics Championships. Sporting excellence visited our school on the final week of term. 210 pupils were fortunate enough to meet Hockey athlete Harry Martin. Harry has competed in London 2012 and Rio 2016 and his stories have inspired our children to become future stars. Pupils were able to see tricks and skills, gain his autograph, have a class photograph with Harry and even sing the national anthem together. Some children were also given tips during mini 5 v 5 games. Harry inspired the children to understand that you can study hard as well as take part in sports. Having finished as runners up in the Luton Competition by an agonising 5 points, we qualified for the county finals in Bedford. Congratulations to all the pupils involved in this both the rain soaked Luton and county competitions. Special congratulations must go to Essah Iqbal, Ayman Rahman, Yunus Ali, Faraz Kayani and Umaiza Choudhry for reaching the major final their competitions respectively. Collectively we finished 5th in the county which is an amazing achievement. Anisha Ahmed has mentioned that she recently visited Dunstable Downs to practice riding up hills ready for next year’s competition – that’s the spirit! Cycling is still a relatively new sport at Denbigh. We would love to see more of you ride your bikes to school. Well done to our year 3 & 4 cricket team who made the semi finals of the county competition. On the hottest day of the year the team had to be sensible resting in the shade between games. The rules of the game are that each team starts with 200 runs. Every time a batter is bowled, caught, run or stumped out 5 runs are deducted. All the pupils must bat, bowl, and field. It is the second time in three years that we have made the semi final of this competition at county level. Following our stunt teams success at the Luton Games in the spring term we qualified for the cheerleading county finals. The team were a credit to the school showcasing some complex stunts in a county worthy routine. The team had a brilliant day at the University of Bedfordshire and learnt a great deal from seeing Cheerleading stunts performed by others. PE Effort Award: Ayyan Bhatti (Bronze), Malihah Hussain (Silver) and Wasseh Jamshed (Gold). Rising Sports Star Award: Humayra Khan (Bronze), Abul Ibrahim (Silver) and Zarah Naseer (Gold). PE Young Leader Award: Mahnoor Tahir (Bronze), Laiba Khan (Silver) and Nafisa Sultana (Gold). Outstanding Achiever Award: Rumaisa Imaan (Bronze), Anjum Murshed (Silver) and Essah Iqbal (Gold). Male Personality Award: Imaad Mehmood (Bronze), Jalal Jabreen (Silver) and Ahmed Mahfouz (Gold). Female Personality Award: Anisha Ahmed (Bronze), Sophia Ahmed (Silver), Fatima Malik (Gold). Special Commendations: Rezwana Nishitah, Dawoud Ahmed and Fatima Malik. PE Effort Award: Zakaria Ahmed (Bronze), Kadijah Mahmood (Silver) and Aisha Khan (Gold). Younger Leader Award: Zainab Choudhury (Bronze), Maryam Ahmed and Amani Ondari (Gold). Outstanding Achiever Award: Shifa Kazmi (Bronze), Isha Hussain (Silver) and Esa Iqbal (Gold). Male Personality Award: Abu Bakr Atif (Bronze), Usman Atif (Silver) and Mahmoud Mahfouz (Gold). Female Personality Award: Thayyiba Khaliq (Bronze), Sahar Iqbal (Silver) and Alisha Shahid (Gold). Throughout the summer term we have provided our pupils with a range of sporting experiences. We secured tickets to eight Women’s Cricket World Cup Fixtures including the final this Sunday! Denbigh Primary was selected as one of only 22 schools nationwide to visit Lord’s Cricket Ground. During the visit pupils were challenged show the spirit of cricket in art, PE and Literacy activities. Pupils have visited the home of football to watch the Women’s FA Cup final as well as attend the World Para Athletics Championships being held in London at the former Olympic Stadium. Last week we announced our Dance Leaders which is a new initiative to help keep PE at Denbigh ahead of the game. Our new leaders were given a tough taste of the role when we visited Marston Vale Middle school. Our pupils are natural leaders, full of confidence and authority. They were able to teach two dances to children in years 6, 7 and 8! To have our 3, 4 and 5 children leading to older students is evidence of how mature and talented they are. We are delighted to announce that we, Denbigh Primary School have achieved the School Games Mark Award for the 2016/17 academic year. This is the third year in a row that we have received the award. With a high number of young people competing in local inter-school competitions this year, we are extremely proud of our pupils for their dedication to all aspects of school sport, including those young volunteers, leaders and officials who made our competitions possible. What a day! Three shows, 60 pupils and 17 routines and loads of spectators. Huge congratulations to all the pupils who performed in today’s gym and dance show. The show consisted of gymnastics, dance and cheerleading routines including technology, shadows and a glow in the dark element. Pupils have been working extremely hard rehearsing during lunch, lessons and after school. A big thank you to all the staff involved as we couldn’t have achieved this success without their help. On Sunday 12th March 2017 we took 70 pupils to take part in the North London Half Marathon. Denbigh Primary was the only school outside of London to take part for the second year in a row! The challenge highlights the importance and enjoyment associated with leading a healthier and active lifestyle, both at home and at school. Pupils covered a total of 12.1 miles prior to race day with the final mile taking place around Wembley Stadium and finishing inside the stadium in front of thousands of supporters. We even had two Denbigh pupils finish 4th and 6th respectively out of approximately 700 school children! All the children did amazingly well and should feel very proud of their achievement. It truly was a fantastic day, thank you to all the parents who supported us on the day and the staff who ran with the children during the event. We entered a pom and stunt team into the cheerleading competition this year. Our pom team finished in 3rd position and were praised for being the only school to include boys. In the stunt competition our team finished as champions. In the stunt routine our pupils had been working extremely hard on a more complex routine in order to impress the judges, and their hard work certainly paid off! This team will now represent Luton at the county cheerleading competition held in Bedford in July. Pupils were also able to learn new skills from a cheer coach which we will now use in choreographing a county worthy routine. Well done to our volleyball teams. On Friday 17th March, the girls A team finished as runners up and the boys A team were crowned undefeated champions. Volleyball is the newest sport in the Luton School Games. It was pleasing to see how far the volleyball team has progressed following its introduction to Denbigh pupils during sports week 2015. Congratulations to our successful volleyball players; Essah Mohammed, Ayman Rahman, Imran Choudhury, Essah Iqbal, Zain Choudhry, Thahmid Ahmed, Abida Muhaymeen, Anisha Ahmed, Saibah Ahmed, Fatima Malik, Nafisa Sultana and Sophia Ahmed. This year we entered two teams into the indoor cricket league. Our B team progressed to the quarter finals of the competition and finished in 5th place following play off fixtures. Our A team were crowned champions of Luton having spent the entire season unbeaten stretching back to November. Congratulations to all the pupils who have represented the school. Luton Diving Club, in partnership with the Amateur Swimming Association and British Diving, were invited to Denbigh to take part in an exciting initiative to unearth Luton’s next generation of sporting stars. Many children are unaware of their sporting talents. Diving is an incredibly technical sport requiring strength, control, stability, posture, power, speed and agility. Pupils in years 3, 4 and 5 took part in an extra PE lesson which was gymnastics based delivered by a qualified coach. Eight Denbigh Pupils showed exceptional performances and were given a personal letter inviting them to attend Phase 2 of the testing procedure (which is a fantastic achievement!). The Phase 2 session will be free and will take place at Inspire Luton Sports Village. Denbigh Primary School was featured on BBC Breakfast TV this term as an example of PE best practice. BBC Five Live radio also featured the school to find out more about the PE programme and how it’s affecting students. This is national recognition of our outstanding commitment to improvement in Physical Education and Sport. Following the Government Whitepaper on childhood obesity, schools have been asked to promote greater levels of PE and sport at primary school. At Denbigh we are committed to ensuring pupils have PE and sports sessions which are engaging and enjoyable. As part of the ‘Talented Sports Programme’ a group of pupils have been learning about themselves as growing and changing individuals with their own ideas. They are encouraged to become more mature, independent and self confident. They identify leadership skills that they already show in PE lessons and those they would like to develop in, in turn encouraging their own sense of personal identity and goal setting. They develop their own sense of social justice and moral responsibility as they lead the project of setting up and delivering KS1 break time games. All pupils enjoyed the opportunity and will achieve a nationally accredited umpire award in table tennis during the summer term. Our year 5 & 6 Girls Football team have been named as champions. This is a fantastic team achievement. The team were thrilled with their win and were a credit to the school. It is also an example of persistence and resilience following an agonising defeat in last year’s final. Congratulations to Umaiza Choudhry, Sophia Ahmed, Fatima Malik, Laiba Khan, Alishba Banyamin and Mahnoor Tahir. Our year 5 & 6 Dodgeball team qualified for the county competition after reaching the final of the Luton Competition on Wednesday 19th October. The team delivered accurate shots and catches to wipe out all teams on their route to the final. The final saw a repeat of the Luton Competition between Pirton Hill meaning Luton schools came 1st and 2nd in the county. It was pleasing to see how far the dodgeball team has progressed following PE lessons experimenting with different tactics. Our team received praised from other teachers for how effective and professional the Denbigh team were. Congratulations to Haaris Maqsood, Imaad Mehmood, Ahmed Mahfouz, Faraz Kayani, Fatima Malik, Nafisa Sultana and Sophia Ahmed. Following rehearsals in our new dance studio the year 1 & 2 team went on to perform at the Luton Schools Games Competition and finished in 3rd place. The theme this year was street dance. If you would like to watch the dance - look out for an invitation to our annual gym and dance show in March2017. Congratulations to Sahar Iqbal, Thaiyyiba Khaliq, Summaiyah Ali, Hibah Zia, Maryam Din, Moseeb Shah and Mahmood Mahfouz. We have just received the prestigious afPE Quality Mark Award with Distinction. This is a fantastic achievement and we are absolutely delighted as we are the only primary school in Luton to receive the award. The award is a powerful way of celebrating success and is recognition of our outstanding commitment to improvement in Physical Education and Sport. As part of the validation process we had a half day visit to the school which included lesson observations, interviews with the head teacher, teachers and pupils as well as verification of evidence presented in the application. Mr West said ‘I am very proud to work at Denbigh. Achieving the highest level of recognition will further raise the profile of PE and Denbigh locally and nationally’. We will receive a certificate, an engraved plaque which will be displayed in reception. On Friday 17th June a group of 12 children visited The Oval Cricket Ground in London to watch Surrey vs. Middlesex in the NatWest T20 Blast tournament. The trip was a reward for those children who have regularly attended the weekly after school cricket club and who have made good progress during the year. For all children who attended, it was their first ever visit to watch a professional cricket match. The children were able to watch international stars such as Eoin Morgan, Kumar Sangakkara, Brendon McCullum and Dwayne Bravo play in front of a noisy sell-out crowd of 26,000 people. The trip was a huge success with the children thoroughly enjoying the experience of watching a live cricket match. Our year 5 & 6 Netball team have been named as the champions of division 2. This is a fantastic team achievement. They managed this in style by going undefeated in the division. Congratulations to Umaiza Choudhry, Zaharah Abbas, Shefa Hossain, Safaa Ahmed, Laaibah Anjila, Aliza Naqib, Misbah Akram, Naimah Choudhury, Sumaia Rahman and Aamaal Hussain. This year we are stretching far and wide to provide our pupils with opportunities to experience professional sport. On Friday 2nd October 2015, a group of pupils went to watch New Zealand vs. Georgia at the Millennium Stadium in Cardiff, Wales. We spent some time in the fanzone soaking up the pre match atmosphere with dance performances before cheering on the New Zealand team as the team coach arrived at the stadium. Our pupils kitted themselves out with face paint, hats, scarves, flags and light up sunglasses before entering the magnificent stadium. The New Zealand haka was performed in front of an attendance of 69,187 to the delight of our pupils before joining in with the singing, cheering, Mexican waves and making noise with the clappers given out beforehand. New Zealand qualified for the quarter finals after running in seven tries against a fierce Georgia side with the final score 43 - 10. On the first day of the tournament the whole school performed the haka in their classes with some able to create their own to the movements. It highlighted how movements can match words and how to get feelings across. It was an enjoyable and loud afternoon for all. To coincide with the Rugby World Cup we held a KS2 Inter-house Tag Rugby competition. Our new sports captains were expected to produce a team and inspire them to play to a high standard. It was a close competition with Sharks (yellow) & Panthers (purple) reaching the final. The 100 house points were eventually awarded to Sharks for a narrow 3 – 1 victory. On Wednesday 30th September 2015, we took part in the school games cross country competition held at Lewsey Park. The level of competition was exceptionally high and our pupils showed an excellent approach to the 1500m course. Well done to Umaiza Choudhry, Fatima Malik, Haaris Maqsood, Ahmed Mahfouz, Cian Keani and Naheed who all performed well in their respective races. Dreaming of becoming an Olympian? On Tuesday 29th September a presentation to KS2 pupils covered the approaching Rio Olympics (2016), the Tokyo Olympics (2020) highlighting how children can access diving at Inspire: Luton Sports Village. Your child has a leaflet in their book bag about diving and several free open taster lessons for them to try diving themselves. Eesah Iqbal and Umayrah Islam are pictured with bronze medalist Hayley Sage who competed in the Women's 3 m synchronised springboard event at the Commonwealth Games 2006, Melbourne, Australia. On 15th May 2015, we took part in the school games cricket tournament held at Luton Town and Indians Cricket Club. It was a mixed start for the year 3 & 4 pupils competing losing two of their opening games in the group, however, we showed the determination and spirit of winners to win the remaining games. Sadly it wasn’t to be and we narrowly lost in a tense final against Beech Hill. Finishing as runners up meant we would represent Luton at the county tournament on Thursday 25th June 2015. A day of Cricket at Bedford International Athletics Stadium finished with us proudly bringing home bronze medals. Congratulations to Dawoud, Haaris, Mussana, Imaad, Sophia, Nafisa, Alishba, Aisha and Fatima. We are so proud of the team and have already started preparations to try and bring gold home next year. Tag Rugby World Record Holders! On 10th June 2015, to mark 100 days to go to the 2015 Rugby World Cup, East Midlands RFU ran a tag rugby tournament with a very special element – the biggest game of tag rugby ever! The following pupils are now world record holders; Imaad Mehmood, Fatima Malik, Alisha Khaliq, Faraz Kayani, Eesah Mohammed, Mirsab Rasal, Sulaiman Ali, Aisha Khatun, Ahmed Mahfouz, Dawoud Ahmed, Ali Malik, Mahnoor Tahir, Zaharah Abbas, Umaiza Choudhury, Alishba Banyamin and Haaris Maqsood. Also taking part was Women's World Cup winner and England 2015 ambassador Maggie Alphonsi. The week provided a fantastic opportunity to encourage young people to be more active and take part in more PE and school sport. I’m sure your child has already shared the success of our first ever sports week. The atmosphere was amazing, the weather was on our side and the children had great fun. Children were given the opportunity to experience a range of sports including; Athletics, Cricket, Netball, Football, Cycling, Dodgeball, Volleyball, Cheerleading, Tri Golf, Dance, Boxing, Team building activities, Hockey, Basketball, Ultimate Frisbee, Parachuting games, Kinball, and Tennis. In class children were developing cross-curricular skills by going on a learning journey around the world and making sporting connections. Pupils have a huge desire for more sport already asking when we are having another sports week! Regular participation in sport not only helps to improve a child’s fitness and wellbeing but it also helps them to develop valuable life and personal skills such as teamwork, confidence and discipline. We take part in many sporting events and currently and are struggling to get kits back in time for other teams. At every sports event we enter, we take pictures of our teams that are then published on our website. For approximately £350 we can purchase 12 full kits with numbers printed on the back and also have our school logo embroidered on the front along with the sponsors logo printed. We would also welcome companies who would like to sponsor trophies and medals for ‘Sports Week 2016’ and/or the end of year ‘Sports Awards’. If you own or work for a local company that might be interested in sponsoring a school sports kit please contact Mr West. On Monday 29th February we played in the first football fixture of the spring term against Foxdell Junior School. It was a tight match ending in a 1-1 draw. Foxdell took the lead but our team kept their heads high and managed to level the score through an Elijah Hill (4NS) goal. Congratulations to Isaiah Hill (6MW) who put in a man of the match performance demonstrating high levels of skill and work rate. Amaan Ali (6AH) pulled off a string of fantastic saves and the team will have felt they should have won the game as we had plenty of chances to win of our own. A Trip to the Theatre of Dreams! 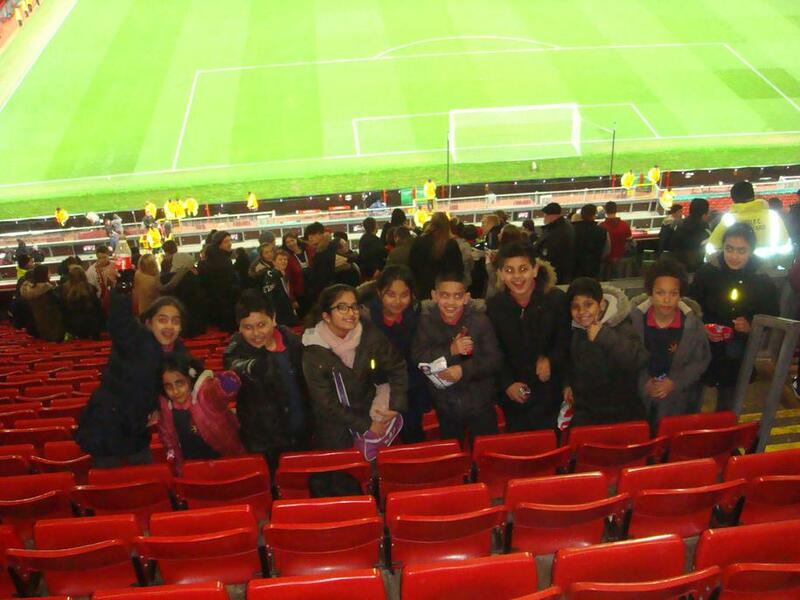 Children from Denbigh Primary School enjoyed a visit to Old Trafford to see Manchester United play live against FC Midtjylland in a European fixture. 10 pupils were given the opportunity to watch football at the largest club football stadium in the country as a reward for their achievements in physical education. The game itself will be remembered for the two goals scored by debutant Marcus Rashford. This is proof for our pupils that hard work and dedication can help you to succeed at the highest level. 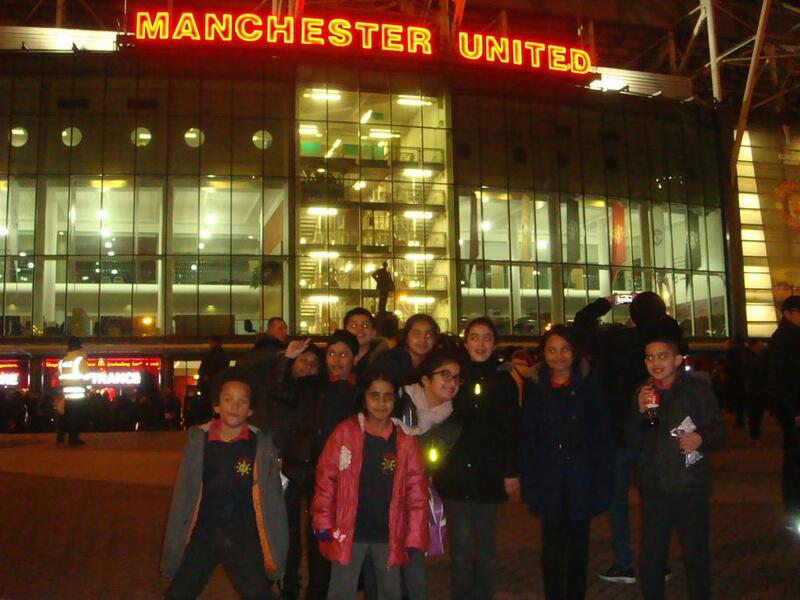 The pupils showed excellent behaviour throughout the trip and took part in singing ‘glory glory Man United’. All of the pupils have had a memorable experience which has enthused and increased aspiration and motivation in sport. Elijah Hill (4NS) had a magical birthday watching the game even if he is an Arsenal fan. 10 pupils from Denbigh Primary School will be taking part in the ‘North London Half Marathon’ on Sunday 20th March 2016. These pupils have been running a mile each week at Stockwood Park in order to achieve the 12.1 miles needed before they complete the final mile in London - crossing the finish line inside Wembley Stadium! Please use the following link if you would like to come and support (free of charge) http://www.northlondonhalf.com/spectators to register your interest in seating at Wembley. 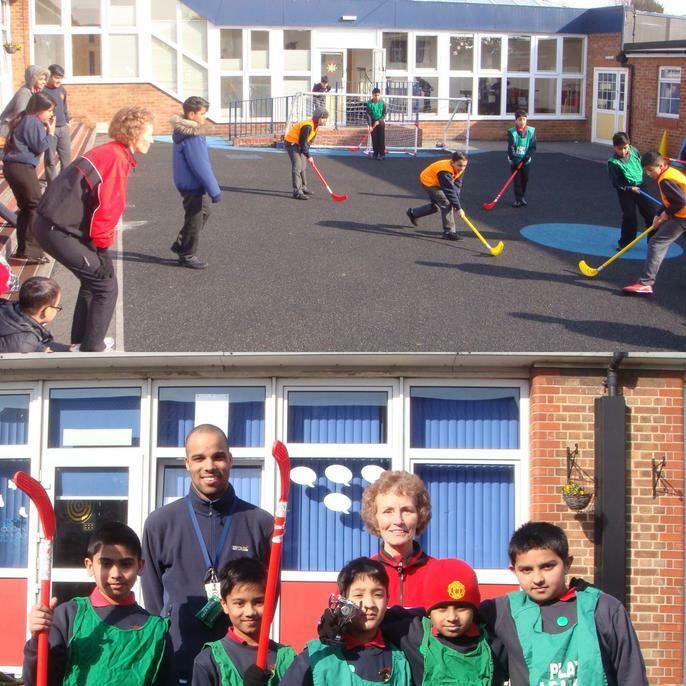 The final between Eagles and Scorpions was held on Friday 26th February saw a guest appearance from Tricia Murphy, vice chairman of Luton Town Hockey Club (LTHC). It turned out to be a tight game between Eagles and Scorpions with Eagles edging it by one goal to earn 100 house points. Pupils were given handouts at the end of the game with details of sessions at LTHC furthering our link with the club. Tricia named Jamiur Rahman (5DC) as man of the match for his control and effective use of his hockey skills. Eagles were presented with the silverware to the delight of the team that had secured the win. Well done to all the year 5 sports vice captains for organising the teams and Haaris Maqsood (5AB) for umpiring and choosing ‘Teamwork’ as the sporting value for the games focus. The year 6 sports captains would have been proud of the vice captains as they usually organise the competitions but were enjoying their trip to Harry Potter World. The Year 5 & 6 netball team took part in England Netball’s world record attempt of playing one match that will last for 90 hours. The record for the largest netball exhibition match stood at 72 hours and 5 minutes and was set last year in Australia. The record coincides with England Netball’s 90th anniversary. 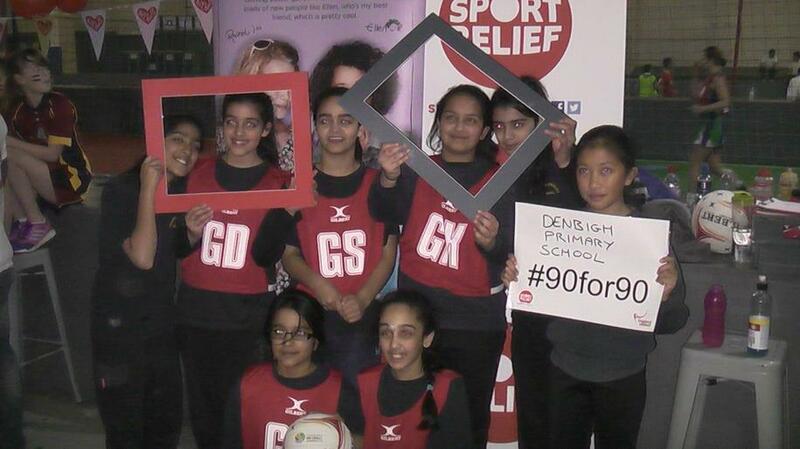 For entering into the competition, the team donated £100 to Sport Relief. The team played for one hour of the 90 at 5pm on Friday 12th February. We played a team from Ipswich to raise money for sport relief. We won our match 12 – 8, although this was not about the result, it is something for our team to be proud of and remember for the rest of their lives. Congratulations to Umaiza Choudhry, Zaharah Abbas, Shefa Hossain, Safaa Ahmed, Laaibah Anjila, Aliza Naqib, Misbah Akram and Aamaal Hussain who are now Guinness World Record Breakers! Following on from Denbigh’s first group game defeat in the indoor cricket league, suddenly with two wins in a row we are back in the frame for qualifying for the quarter finals. The first win came on the 1st February against Sundon Park, with a superb performance from Aamaal Hussain (6MW), who took a brilliant hat-trick. The second win was a must win game against Dallow. The team demonstrated a combination of good skill, great determination and a fantastic team spirit. It is important that all pupils wear the correct P.E. kit during lessons and extracurricular clubs. P.E kit is black/Navy shorts, black/Navy tracksuit bottoms, Navy t-shirt (Denbigh Logo) and sports trainers.